The purpose of this article is to identify some of the practical problems associated with the implementation of the Dangerous Prisoners (Sexual Offenders) Act 2003 (Qld) (DPSOA). One of the major areas of concern is that the time the released prisoner spends in custody, following a breach of a supervision order, is not added onto the prisoner’s period of supervision. In that regard, the prisoner is effectively missing out on valuable rehabilitation. The Act was designed to protect the community from dangerous sexual offenders and to offer those offenders a system of rehabilitation, following their release from prison. Although the High Court has held that the DPSOA is constitutionally valid, the author believes that the legislation is difficult to implement in its current form, and redrafting specific sections will make the legislation work more effectively. The article examines the Queensland case law and administrative processes of administering the “character test” in applications for admission to legal practice. The article reports on the views of the Secretary and the Chair of Legal Profession Admission Board. These insiders provide unique perspectives on how the admission system really works. In New South Wales and Victoria there is a very new regime governing lawyers under the Uniform Law. It is therefore timely to consider whether anything has changed in relation to admission in those States. The article compares the Queensland admission regime which has remained the same since 2004 to those in New South Wales and Victoria in respect to suitability considerations. The authors find that there are many similarities across jurisdictions, but also point to some notable differences in how authorities approach the collection and evaluation of evidence about applicant suitability. The authors evaluate the respective strengths and weaknesses of these systems. 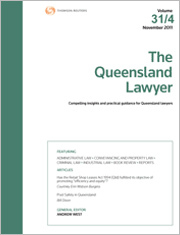 For the PDF version of the table of contents, click here: Qld Lawyer Vol 35 No 4 Contents.